These stunning mahogany choirstalls were carved around 1750 by a well-known artist from Seville, Pedro Duque Cornejo, and a team of artisans. The project was an enormous one, employing up to 46 workers at a time and costing 913,889 reales and 6 marevidíes. 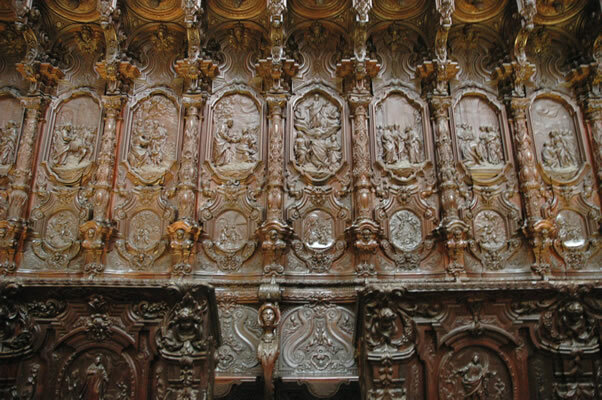 It is one of the last masterpieces of the Spanish Baroque and the last carved choir stall to be built in Spain. The sculptor, for a yearly salary of 300 ducados, agreed to carve two medallions for each of the imposing stalls. One was to be a large one depicting a scene from the life of Jesus or the Virgin Maria; and the smaller one was to depict a passage from the Scriptures. Pedro Duque Cornejo, however, did not survive to see it finished. He died at 80 years of age, shortly after presenting the last of his clay models for approval. He was interred not far from the choir stalls (which would be finished a few months later) in an ostentatious funeral paid for by the Church. His tombstone is near the four-sided choir lectern.